The maps below show the locations of various places that may be of interest to SIGCOMM attendees. 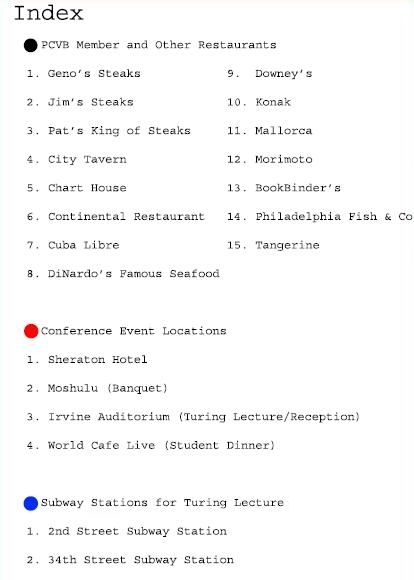 In particular, the maps show the conference event locations, the subway entrances needed to get from the hotel to the Turing lecture, and some local restaurants recommended by the organizing committee. Clicking on each of the six sections of the map should trigger a popup window showing that section in greater detail. The colors and numbers of the dots may be referenced using the legend provided below. A printer-friendly map is available here. The legend for the map is available here. Map courtesy of Philadelphia Convention and Visitors' Bureau.